The 75th Fighter Squadron has approximately 60 personnel and maintains a combat-ready posture capable of deploying A-10C aircraft and personnel worldwide on short notice to conduct close air support, interdiction, day and night forward air control, and combat search and rescue missions in support of US national objectives. The 75th Fighter Squadron was first constituted as the 75th Pursuit Squadron (Interceptor) on 17 December 1941. On 4 July 1942, the 75th Fighter Squadron was activated into service in the China-Burma-India theatre following the disbanding of the legendary American Volunteer Group known as the “Flying Tigers.” Under the leadership of Air Force icons David “Tex” Hill and Johnny Alison, the 75th achieved unparalleled supremacy in combat, further elevating the legendary status of the Flying Tigers. After World War II, the squadron returned to the United States and was inactivated on 5 January 1946. Over the next 25 years, the 75th Fighter Squadron distinguished itself flying the F-86, F-89, and F-101. This timeframe included a constant stream of squadron moves, activations, and inactivations, during which the squadron was assigned to bases in Guam, Panama, Maine, New York, and Michigan. On 1 July 1972, the squadron was activated as the 75th Tactical Fighter Squadron at England Air Force Base, Louisiana flying the A-7 and then the A-10. On 18 November 1991, the squadron relocated again and was activated on 3 April 1992 as the 75th Fighter Squadron at Pope Air Force Base, North Carolina. During its service at Pope Air Force Base, the 75th deployed in support of Operation SOUTHERN WATCH and IRAQI FREEDOM. After 15 years at Pope Air Force Base, the 75th Fighter Squadron found its current home, Moody Air Force Base, GA due to the 2005 Base Relocation and Closure alignment. Since its move to Moody Air Force Base, the 75th has deployed several times to Afghanistan in support of Operation ENDURING FREEDOM and most recently to Osan AB, Republic of Korea to help maintain stability on the Korean Peninsula. 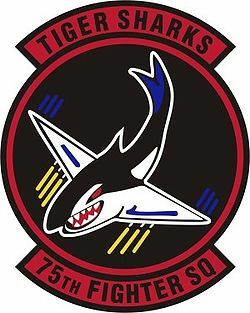 As part of the famous 23rd Fighter Group, 75th Fighter Squadron has proved its combat prowess and will continue to uphold the finest standards set forth by past and present Tiger Sharks. The Japanese were bombing Hengyang, China, nightly when the town’s mayor asked that we intervene to end the attacks. On July 4th, 1942, the same day of the 75th Fighter Squadron’s activation, the unit performed the first ever night interception flights over China against Japanese bombers. The 75th excelled and was credited with two bombers shot down and two probables! In appreciation for the success of the mission, the Mayor of Hengyang presented each member of the 75th Fighter Squadron a ring engraved with the image of a shark. The shark on the ring inspired an orderly room clerk, SSgt Robert E. Ceperley, better known as “Cep”, to redesign the shark as the 75th Fighter Squadron’s insignia. The insignia became so popular that the squadron’s pilots and ground crew asked Cep to paint the shark on their aircraft. Major elements of his original design are included in the current squadron patch. The deadly Tiger Shark diving with guns blazing represents the power and aggressiveness with which the attack is brought upon the enemy. The black background signifies the might and determination to protect friendly forces while attacking enemy targets. The red memorializes the sacrifice of members of the 75th in past and future combat operations. The yellow gun flashes signify the unit’s striking power, and the blue tail flash, wing flash, and airflow off of the wing tips represent the sky, the Air Force’s primary theater of operations.